Tattoo removal is a growth industry. And I suspect it’s only going to get bigger in 2017 when people sober up after the general election this November. With Donald Trump closer than ever to being the next President of the United States, supporters are showing their allegiance to the man in increasingly drastic fashion. And it’s not just in the form of vicious sucker-punches. People are getting Donald Trump tattoos. But getting tattoos of your favorite political candidate is nothing new. Below we have a few examples of people who have gotten Trump tattoos, along with some diehard Bernie supporters. I’m publishing their names in the interest of posterity. We’re going to check in on these people to see if they still have their tattoos when Trump takes the oath of office on January 20, 2017. Jason Szkup of Leivittown, N.Y., shows his “Trump 2016" tattoo to Republican presidential candidate Donald Trump as Trump autographs copies of his new book, entitled “Crippled America,” at Trump Tower, in New York, Tuesday, Nov. 3, 2015. 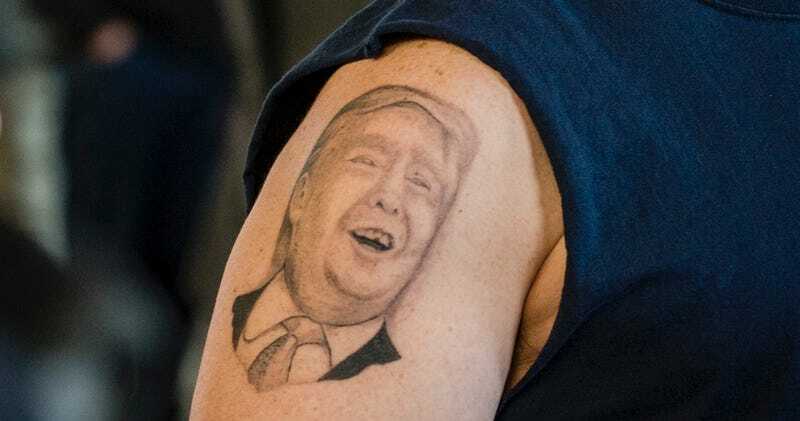 One tattoo shop in New Hampshire offered free Donald Trump tattoos when the nation’s eyes briefly gazed at the Granite State. Roger Tomlinson, of Oklahoma City, center, sports a new tattoo of Democratic presidential candidate Sen. Bernie Sanders, I-Vt., as he cheers for the candidate during a campaign rally at the Cox Convention Center Arena in Oklahoma City, Sunday, Feb. 28, 2016. Anthony Borbell, 44, of Warren, Ohio shows his tattoo of Republican Presidential Candidate Donald Trump at Youngstown Airport on March 14, 2016 in Vienna, Ohio. Obama supporters seemed a little more committed to hopey changey stuff in 2008. Democratic presidential nominee U.S. Sen. Barack Obama (D-IL) greets supporters after speaking during a rally at Cashman Field September 17, 2008 in Las Vegas, Nevada. And then there was this guy. Dear God, remember this guy? He had his Romney face-tattoo removed in December of 2012, not long after Romney lost the previous November. Eric Hartsburg, an Indiana-based wrestler and one-time fan of GOP presidential candidate Mitt Romney, who tattooed the Romney campaign logo on his face, is seen at the office of a doctor who specializes in removing tattoos, in Beverly Hills, Calif., Tuesday, Dec. 11, 2012. Eric will undergo about a dozen treatments to remove the stylized Romney “R” tattoo from his face. I wonder if he’d have kept it even if Romney had won. Well, whatever candidate you choose, remember that tattoo removal has come a long way since the days you got that Dole/Kemp tattoo.